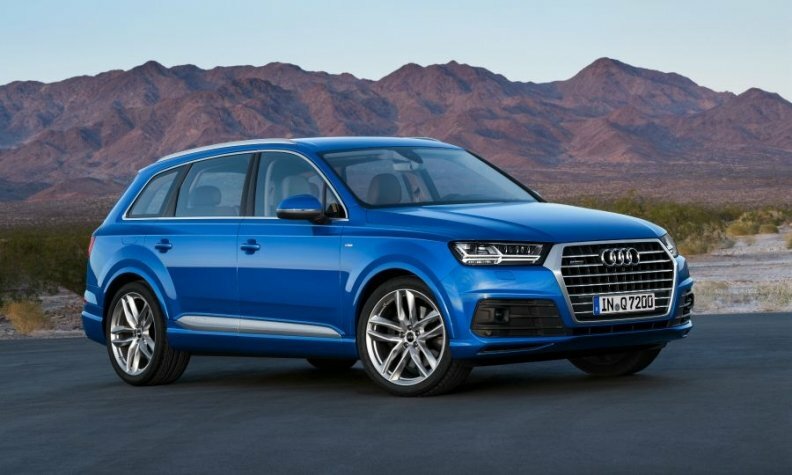 Customers trading in an older diesel can get 10,000 euros off a new Audi Q7. MUNICH -- Germany's effort to clean up diesel's dirty image by getting older, more polluting models off the road is likely to spur a rush for trade-in deals from the country's automakers. As many as 1.3 million German car owners are set to accept rebates of as much as 10,000 euros ($11,700) per car from Volkswagen Group, Daimler and BMW in a cash grab reminiscent of the government's 2009 scrappage program. The incentives will jolt demand but could still leave more than 5 million diesel autos with outdated emissions systems on German roads. Automakers, also including Ford, are targeting rebates at drivers of diesel autos delivered before the end of 2010, which currently number about 6.4 million vehicles in Germany. Intended to encourage purchases of cars meeting the latest pollution regulations, the incentives are the result of an agreement with the government last week aimed at preventing a crackdown on the fuel. As many as 20 percent of owners of vehicles complying with now-outdated Euro 1 to Euro 4 emissions standards could take up the carmakers' offer, according to consulting firm Oliver Wyman. "This rebate program is an important element in the plan to get older polluting cars off the road and improve diesel's image," said August Joas, head of Oliver Wyman's global automotive practice. "The cars eligible for the rebate will be quite old. So for people considering the program, the jump to buying a new vehicle will still be significant." Real exhaust emissions from diesel vehicles often far exceed what is measured in lab conditions, making some customers hesitant about the fuel after Volkswagen's test-cheating scandal brought the issue to light. Even so, demand for the models in Germany has only narrowed rather than collapsed. Diesel cars accounted for 41 percent of total auto sales in July, compared with 46 percent for all of last year. Institutional buyers including corporate, government and rental fleet operators, which make up two-thirds of Germany's annual car demand, have been slow to react to the barrage of criticism facing the technology. "We do notice that our fleet customers are considering which type of engine is best amid the current discussion on emissions manipulation and driving bans," Sixt Leasing spokesman Stefan Kraus said. "But because of the low cost of ownership of diesel cars and great mileage, the majority of orders remains for diesel engines." For the trade-in program, manufacturers will bear the cost of the incentives, with Volkswagen affected to the tune of 400 million euros to 1.2 billion euros, according to research company Evercore ISI. At the same time, the program is set to help carmakers' bottom line by boosting demand for pricey new models. Trade-ins of just under 1.3 million autos would equate to 38 percent of last year's new-car sales in Germany, which amounted to 3.35 million vehicles. That puts the diesel plan in a similar league to a government-paid scrappage program in 2009, when a rebate of 2,500 euros prompted owners of 2 million cars nine years or older to turn them in and buy new vehicles. The incentive ended once spending reached 5 billion euros. The incentives proposed this month are available until the end of the year, though vary significantly between the automakers. Volkswagen will pay drivers 2,000 euros to buy a new VW Up small car and 10,000 euros on purchases of VW Touareg or Q7 sport utility vehicles from its Audi brand, including the value of the used car. Meanwhile, Daimler's Mercedes-Benz nameplate and BMW are offering 2,000 euros on top of the trade-in value. Carmakers are using the program to push sales of mixed combustion engine-electric or battery-powered models with additional incentives. Audi will double its share in an existing green-car bonus, offering an extra 1,500-euro incentive on the purchase of a plug-in hybrid. "Back in 2009, people queued around the block to trade in their cars," and "we expect as many as a third of these owners to take up the bonus scheme," said Juergen Karpinski, managing director of Frankfurt's Autoschmitt dealership. "We are really glad to finally have a deal on diesel on the table and get back to a factual discussion about the technology. Consumer uncertainty on the issue is enormous."